First of all, I wish thank OpenRice for giving me an opportunity to participate in this MakanVentures event held at the Chef Low Organic Kitchen, 10 Boulevard, Kayu Ara. This was my first time taking part in this wonderful event where I have had enjoyed a delicious 'fruity' vegetarian and jovial dinner with great fun at the same time. 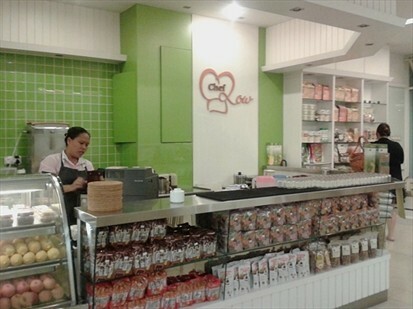 Chef Low Organic Kitchen provides a spacious, cozy and comfortable environment with simple yet elegant white interior designs. 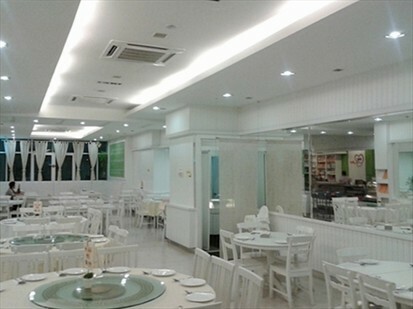 This vegetarian restaurant is serving a wide array of pure vegetarian dishes including local cuisine, Chinese, Thai, Japanese and Western cuisine. They are using organic vegetarian ingredients with no added flour, egg, onion, garlic, preservative and MSG. Chef Low Organic Kitchen being an organic vegetarian restaurant, they also have a section selling a variety of organic vegetarian products near to the entrance. During the self-introduction session, we were served with a pot of warm and aromatic fruit tea together with short tiny glasses. 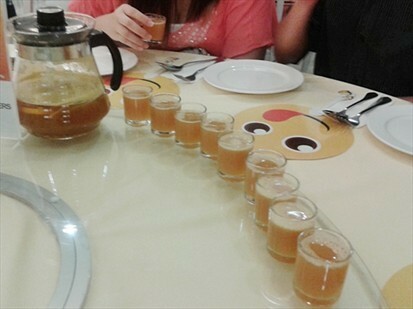 The fruit tea was freshly brewed combination of organic tea and orange juice with slices of fruit mixtures including red & green apples, oranges, lemons and passion fruits. The fruit tea was rich in flavor, contains of natural sweetness and quenches thirst effectively. 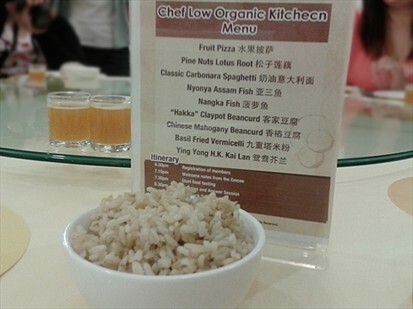 Chef Low Organic Kitchen has generously prepared total of nine delectable dishes for this MakanVentures event and it was served with healthy brown rice. The brown rice texture was fluffy and slightly chewy. Brown rice is a more healthy choice and more filling compared to white rice. Here comes the first signature dish, Nyonya Assam Fish 亚三鱼 with the distinctive aroma of assam flavor and looks like real 'fish' portion. The sourish and mild spicy taste of nyonya assam has opened up everyone's appetite. The assam 'fish' was delicious with soft and chewy textures. It was made of soybean and has the 'tofu' taste. 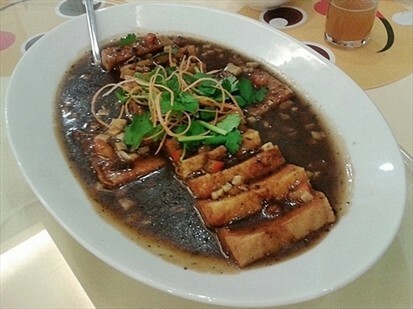 The second signature dish served was Chinese Mahogany Beancurd 香樁豆腐. These homemade beancurds was deep fried until golden brown, then topped with the piping hot Chinese Mahogany sauce and adorned with parsley. These beancurds was delicious and taste buds friendly, it has became soft and moist after being absorbed the goodness and savory Chinese Mahogany sauce. Chef Low Organic Kitchen provides good services with speedy serving time. The third signature dish served was the Classic Carbonara Spaghetti 奶油意大利面, it was creatively presented with green and purple lettuce 'blossomed' at the center of the spaghetti. This recommended Classic Carbonara was served with smooth and slightly chewy pan-fried spaghetti, fresh crunchy lettuce and French beans, tasty button mushrooms and went pretty well with its thick and creamy homemade Carbonara sauce. Pine Nuts Lotus Root 松子莲藕, was a mouth-watering stir-fried dish with slices of lotus root, pine nuts, ginkgo, green peas and carrots. This dish was very tasty, especially the lotus roots was extra crispy and crunchy. Ying Yong H.K. Kai Lan 鸳鸯芥兰, is a famous dish with two tastes - crispy Kai Lan leaves and crunchy Kai Lan stems. The leaves was separated from the stem, cut into stripes and fried until crispy, while the stems are stir-fried. This dish was nicely arranged and appears like a 'tree' with the crispy Kai Lan leaves sprinkled with pumpkin floss at the upper part of the serving plate and the stems at the lower part. Next up was the "Hakka" Beancurd 客家豆腐, it was served in a stainless steel wok. 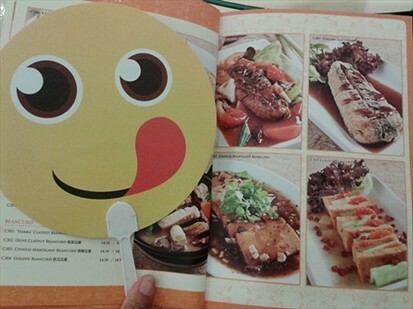 The main ingredients are homemade beancurd, vegetarian salted fish, broccoli, cauliflower and fermented beancurd. 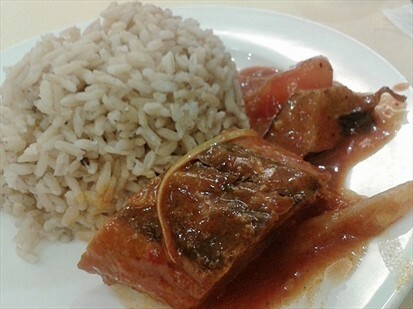 It was a delicious and flavorful dish except for the vegetarian salted fish which was quite salty. Basil Fried Vermicelli 九重塔米粉, it was attractive and colorful appearance of vermicelli with shredded carrot, purple cabbage, white cabbage, red capsicum, beansprout, basil leaves and sprinkled with pumpkin floss. The vermicelli was yummy with fresh flavorful and crunchy vegetable mixtures, and has a strong hints of basil leaves. The most anticipated Fruit Pizza 水果披萨, a freshly baked thin crusted pizza with vegetarian mozzarella cheese, slices of apple and topped with strawberry sauce. The Fruit Pizza was awesomely delicious with its crispy thin crusted outside and juicy apple slices inside, perfectly matched with the flavorful strawberry sauce and vegetarian mozzarella cheese. The fruity vegetarian journey was ended with the Nangka Fish 菠萝鱼. I love this Nangka Fish very much with crispy fish texture and savory sauce with sweet nangka stripes. The vegetarian fish was wrapped with seaweed, deep-fried to perfection, served with sweet savory sauce and adorned with fresh nangka stripes. 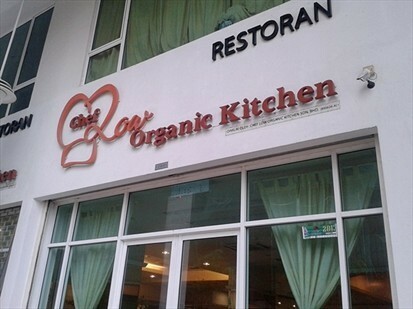 Once again, I like to thank Chef Low Organic Kitchen for offering nine mouth-watering dishes to MakanVentures event. I will definitely return to savor more delectable dishes in near future. TGI Friday's @ One Utama, is an ideal place for organizing events, birthday celebrations or just simple gathering of friends and family members while enjoying the authentic American food and drinks. Championship BBQ Chicken is one of the TGI Friday's signature dish, it comes with a half bird roasted chicken, topped with their homemade Championship BBQ sauce and served with two side dishes - cheddar cheese mashed potatoes and onion rings. The Championship BBQ Chicken was delicious and grilled to perfection with tender succulent textures, and taste great with its Championship BBQ sauce. The onion ring was deep fried to crispy golden brown and onion inside was juicy. Meanwhile the mash potatoes was smooth but does not have the cheddar cheese taste. Kushi Q @ Tropicana City Mall is specialized in Japanese grilled cuisine, Teppanyaki. There are six choices of Teppanyaki set available here namely, chicken teppanyaki set, beef, salmon, prawn, mackerel fish and scallop, with price ranges from RM9.90 to RM16.90. The Chicken Teppanyaki Set was served with bean sprout and mixed vegetables, chicken teppanyaki, white rice, miso soup and cut watermelon. The chicken teppanyaki was chopped into tiny pieces and the serving portion was relatively small compared to the bean sprout and mixed vegetables bigger serving portion. White rice being served instead of Japanese rice. Miso soup was very salty. Need some improvements in their food preparation. Lin Yuan Steamboat Kitchen 淋园火锅小馆, is well-known for their specialty Golden Pumpkin Porridge steamboat. The charges for one person is RM16.90 and they required minimum of two person to dine-in. This is the standard steamboat set for two person. It comes with a variety of steamboat items such as medium size prawns, dumplings, fish balls, fish noodles, white tofu, fried tofu, fu chuk, imitation crab sticks, Chinese cabbage, baby corn and few others. The pumpkin porridge soup base has been pre-cooked and it was served in a large steamboat claypot. Light up the gas stove and bring the pumpkin porridge to boil. When it started to boiled, crack a raw egg into the soup base and stir well, follow by adding the rest steamboat items. The pumpkin porridge was smooth and flavorful with no added MSG and preservatives. It is refillable with no additional charges. Enjoy the natural goodness of pumpkin porridge and freshest seafood items which was supplied directly from Pulau Ketam. Yummilicious!